CALM…one word, express in one hundred words in one hundred days. Calmness Means I Might Be Facing Challenges But God Is With Me. You Are Still To Watch God Be God But Calm To Make You Be You. 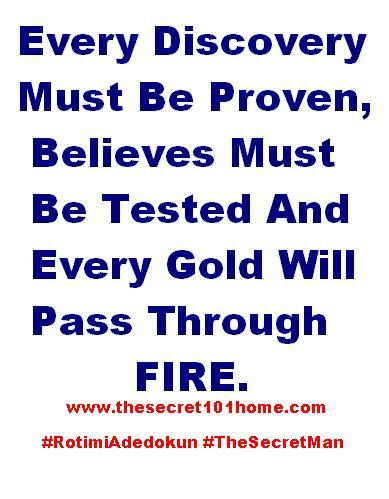 Every Discovery Must Be Proven, Believes Must Be Tested And Every Gold Will Pass Through Fire. Alongside Life Will Questions Your Hope And Doubt Will Fight Your Trust. You Can’t Prepare Enough For The Life Test Because Nobody Knows When. But From Experience Mostly They Come At Night. A Time You Think It Is Right For You To Rest. The Good News Is That No Matter How Difficult It Is, You Cannot Fail. This entry was posted in Life and Time Management, Self Development, The Secret, Vitamin Of The Mind, You! and tagged Bishop David Oyedepo On Trust, Calm Down, How To Be In Charge In The Middle Of Storm, Jim Rohn On Life, Pastor E A Adeboye On Calmness, Rotimi Adedokun Calmness, Those Who Trust In Lord. Bookmark the permalink.